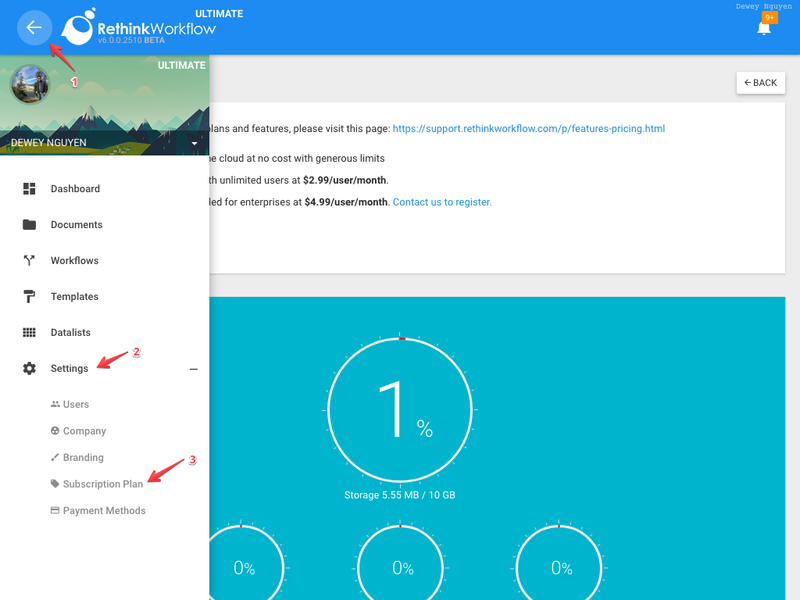 Version 6.0 (v6.0) of Rethink Workflow has just been released in December 2018 and it is the biggest and most exciting release we have done so far. Sizes: allow to specify the width of the field on different screen-sizes: phone, tablet, desktop, and large desktop. Validation: allow to set specify required and invalid errors, advanced validating function with placeholders supported. Show / Hide: controls field visibility condition with placeholders supported. Permission: allow to set individual field permission per state. More detail placeholders including streetNumberOne, streetNumberTwo, city, state, postalCode, formatted, latitude, and longitude. Comment: the comment field has been deprecated and replaced by Document Commenting feature. Sequence ID: this field has been deprecated and replaced by document key. The system automatically generates a document key based on workflow key. Column cell input supports 10+ different types including dropdown with data list support. 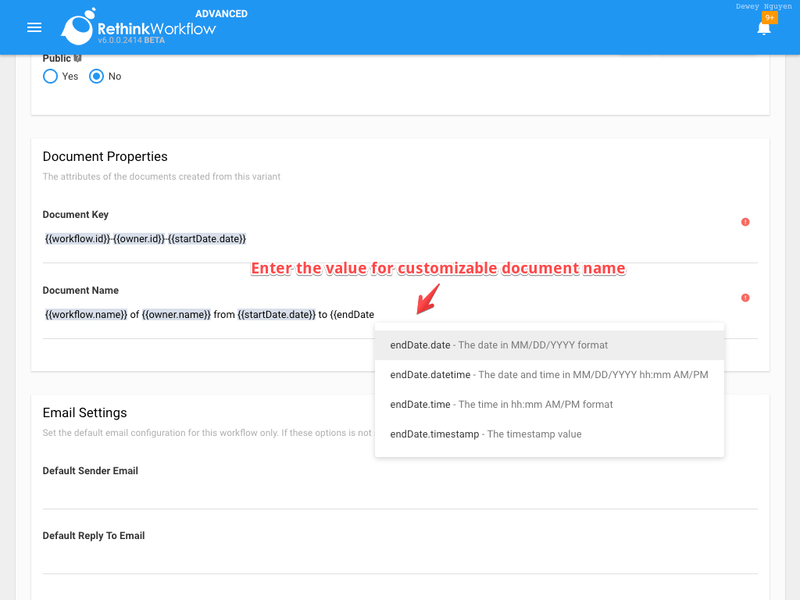 Create a form/process from predefined templates. We will be adding more and more templates for different categories very soon. Allow disabling validation for fields. For example, the comment is required on Decline action but optional on Approve action. 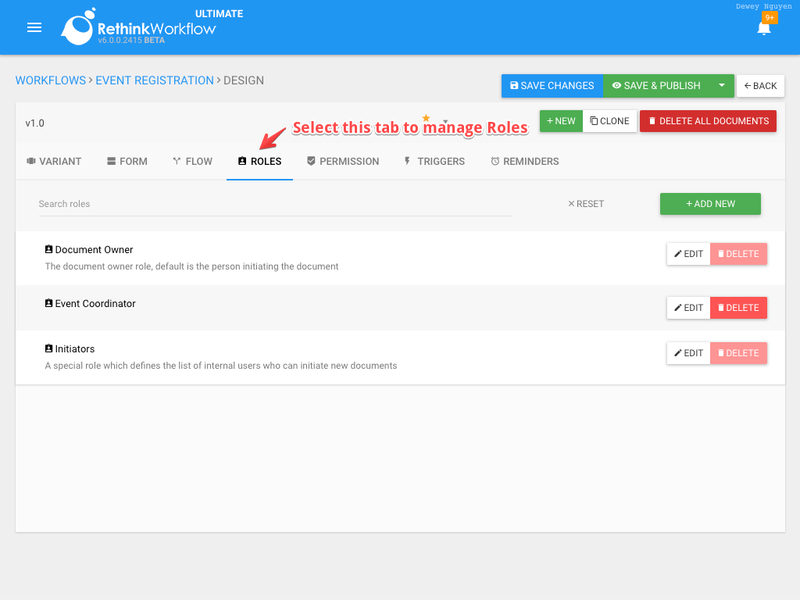 The biggest change on this version is Role-based Access Control in which the workflow designer can create roles and assign users to a role. Improved reporting: provide a simple-yet-powerful reporting mechanism for running and extracting document values into a tabular format. Company Branding: allow to change the look-and-feel of Rethink Workflow to match with your company brand. Streamlined authentication and creation process: improved the way the system authenticates the end-user so that creating an account and signing in is much easier, especially for public workflow. Change the sender and reply-to per workflow variant: allow to use a different email address as the sender or reply-to when sending email notifications to the user. 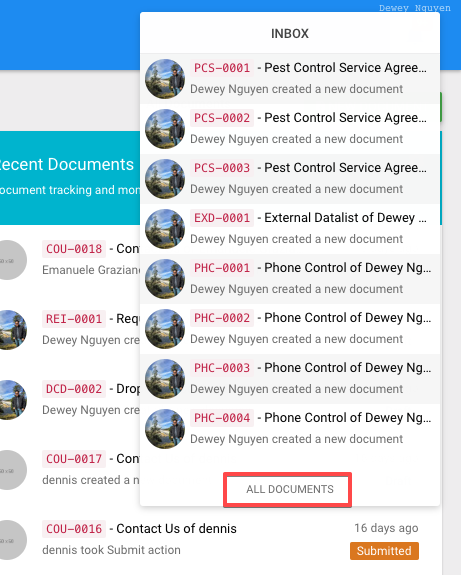 For documents created from a public workflow, the system now saves the document after each change to avoid losing data. Support resetting the field values of the document back to what they were when the document first moved to the current state. Assign each document with a unique ID (TSA-0001) using the corresponding workflow key. This feature makes it easier to uniquely mention document instead of using the long id previously. A regular user is able to trash, delete, or restore the document when it is in the initial state. And a ton more minor improvements and bugfixes. 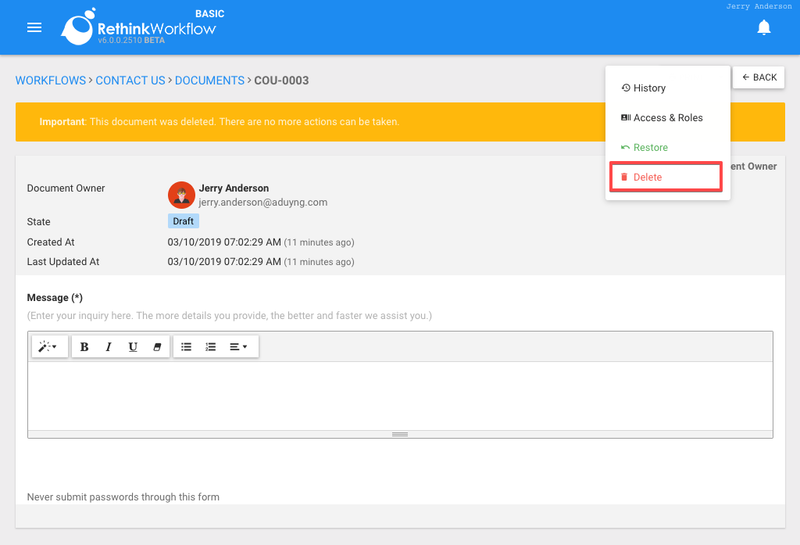 Rethink Workflow allows you to create easy-to-use forms to capture quality data from the end-users. The system also enables to create powerful flows to streamline your organization business processes. The last piece of this puzzle is reporting, which is a way for you to view, search, filter, and extract entered values from the system for your own purposes. There are two types of report: overall report and workflow-specific report. A workflow-specific report is having exactly the same features as in the overall report above, but for a particular workflow. 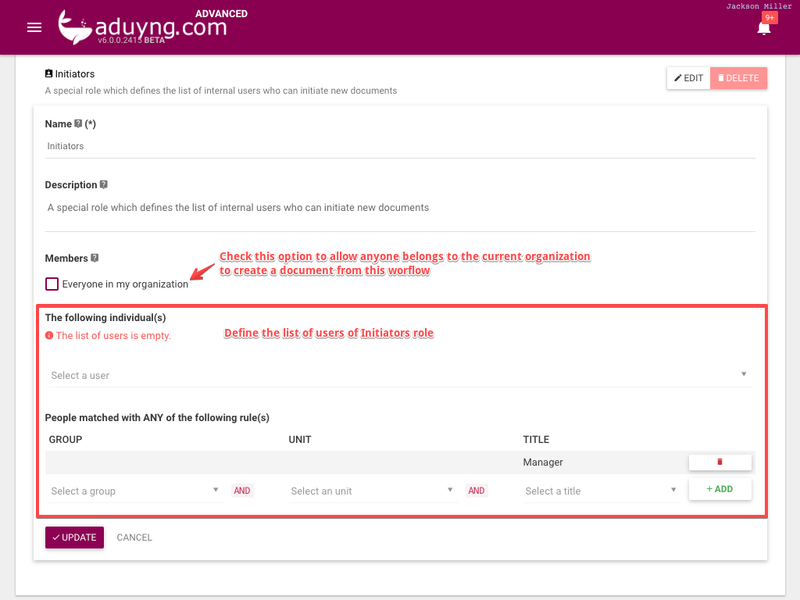 From the workflow-specific dashboard, you can follow the same method 2, 3, 4 above to get to the report for this workflow. To add a new filter, click on FILTERS button on the right-hand side. On the popup dialog, search and select the filters you would like to add. The predefined filters are in black color while the filters provided by form fields are in orange color. The demonstration below shows how to add, use, and remove a filter. To add a new column, click on COLUMNS button on the right-hand side. On the popup dialog, search and select the columns you would like to add. Similar to filters, predefined columns are in black and columns provided by form fields are in orange. The video below demonstrates actions can be performed on columns. To export data from a report to CSV or JSON format, select EXPORT button on the right-hand side, and click on the desired format. Note that the data exported only include the columns you selected. You can also save the report filters and columns for later retrieval. To save a report, click on SAVE AS button and provide the name and description on the popup dialog and click on SAVE. After that, you can click on the arrow next to the report name to switch between the report. How to move to trash, restore, or delete a document? 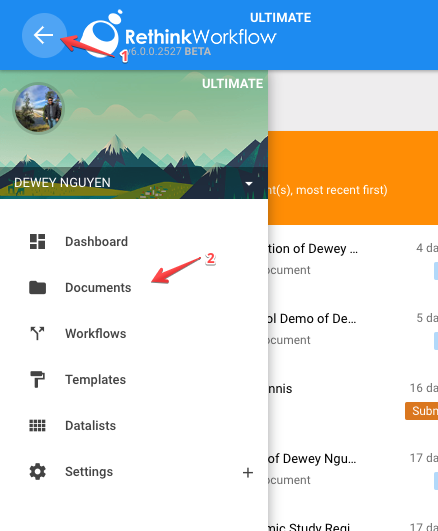 Documents in Trash won't show up in your Inbox or Recent Documents widget. To see the trashed documents, you can click on VIEW ALL link below your Inbox or Recent Documents widget. 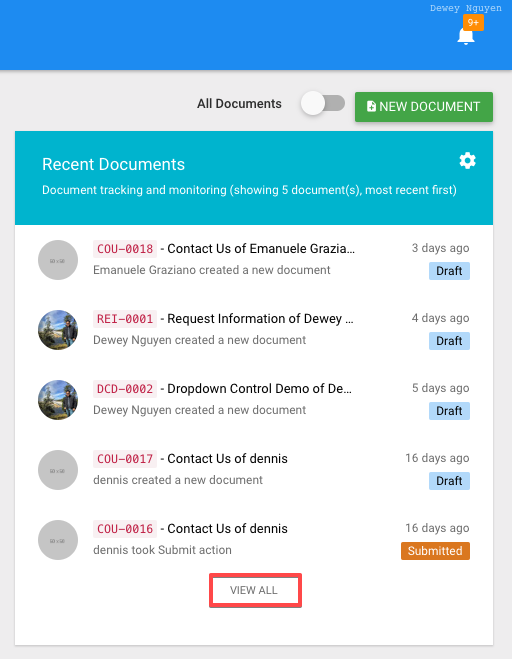 Trash documents are still counted in Usage Statistics since they are stored in Rethink Workflow. To restore a document, go to the document view screen and click on "Restore" menu item. As a user, you can delete your own document once it is in Trash. A deleted document won't be counted in your company Usage Statistics. 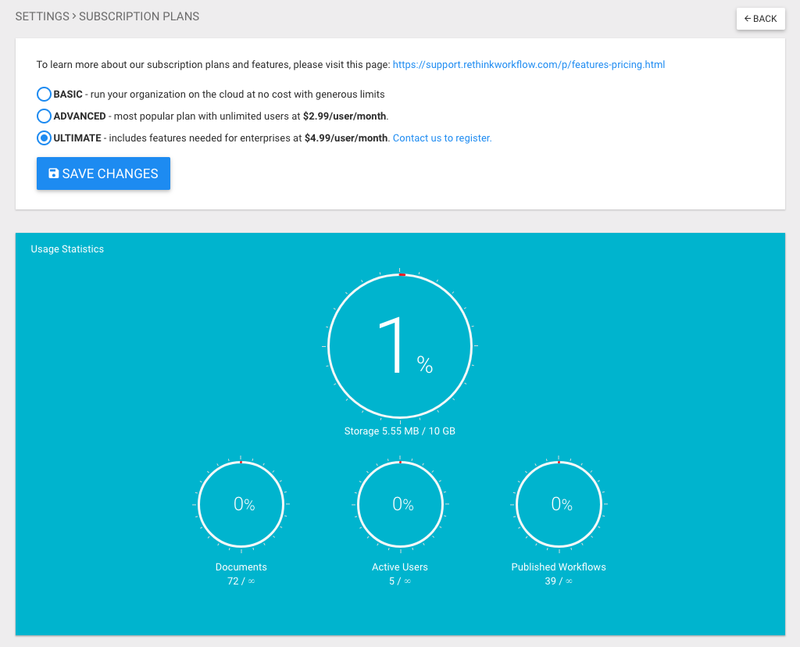 Rethink Workflow offers a quick glance at the usage statistics according to the subscription plan that your organization is in. 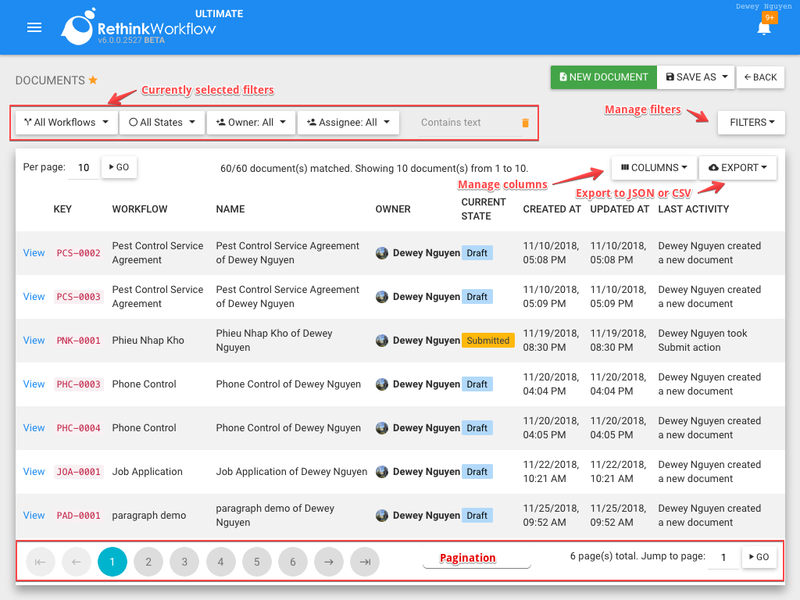 To view the usage statistics, as an administrator, click on the "hamburger menu", expand the "Settings" section, and click on "Subscription Plan"
Timesheet control is one of the ULTIMATE Subscription controls which can be used by the company to allow its employees to enter their daily work hours. 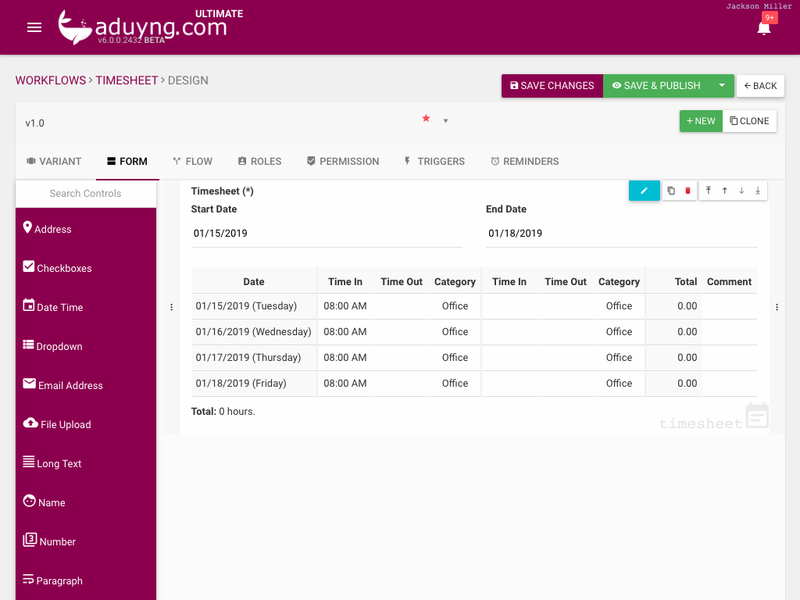 Admin can set the startTime, endTime, intervals and categories for each of the timesheet in the workflow. To add timesheet control to your form, simply drag and drop it from the control panel to the form-design area. To adjust the properties specifically for TIME SHEET field, click on TIMESHEET OPTIONS tab on the properties panel below the timesheet control. interval (Time Interval for time dropdowns): This field sets the intervals between options in the timesheet. For Example: If the interval is 15, then it means 15 minutes and the dropdown options will be 8:00 AM, 8:15 AM, 8:30AM and So on. startTime (Start Time): This field sets the startTime of the day for the timesheet control. endTime (End Time): This field sets the endTime of the day for the timesheet control. categories (Define Categories): This fields allows the admin to set the available categories for which a user can add the time. The animation below demonstrates how the end-user interacts with a timesheet control. To include a timesheet field in the list of columns of the report, click COLUMNS button and select the respective timesheet field from the pop up. To export the timesheet values, click on EXPORT button and select the desired formats. 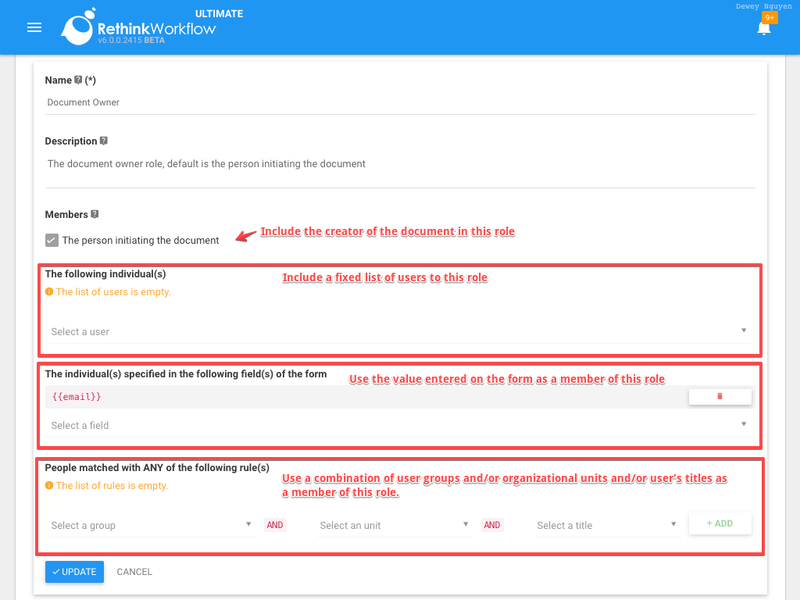 There are several ways to create or initiate a new document from a workflow. When you are on the overall dashboard, click on the "NEW DOCUMENT" button to start creating a new document. On "SELECT A WORKFLOW" screen, click on the button on the right of the desired workflow to create a new document. 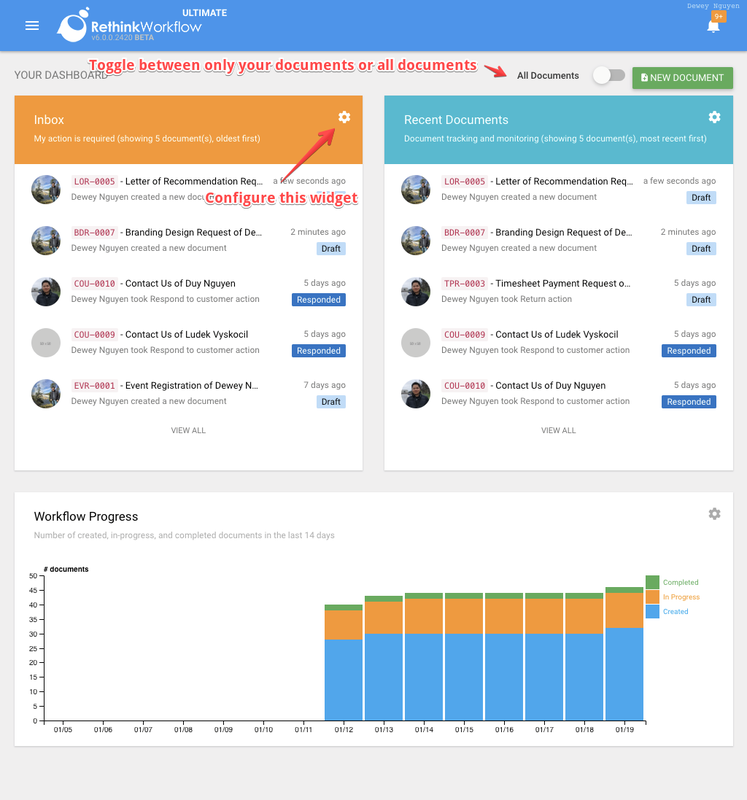 If you are already on the workflow dashboard, simply click on "NEW DOCUMENT" to initiate a new document from that workflow. 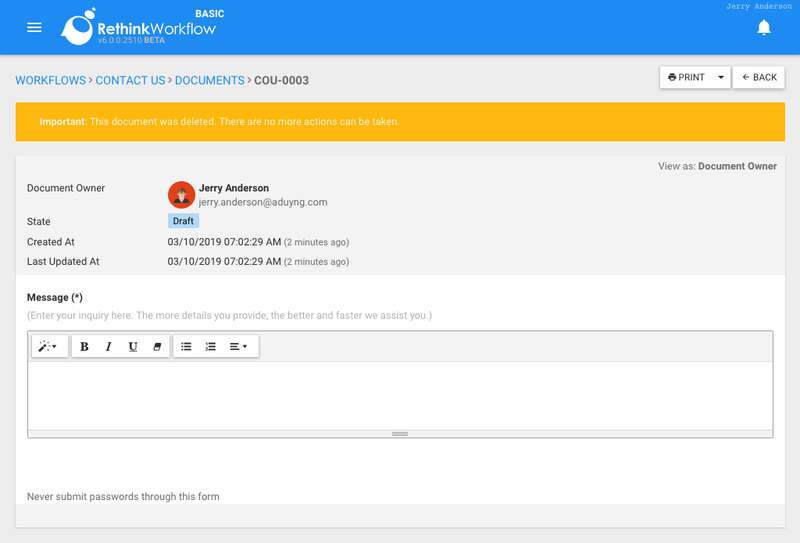 If a workflow is made public, any public user can use the link provided to create a new document. 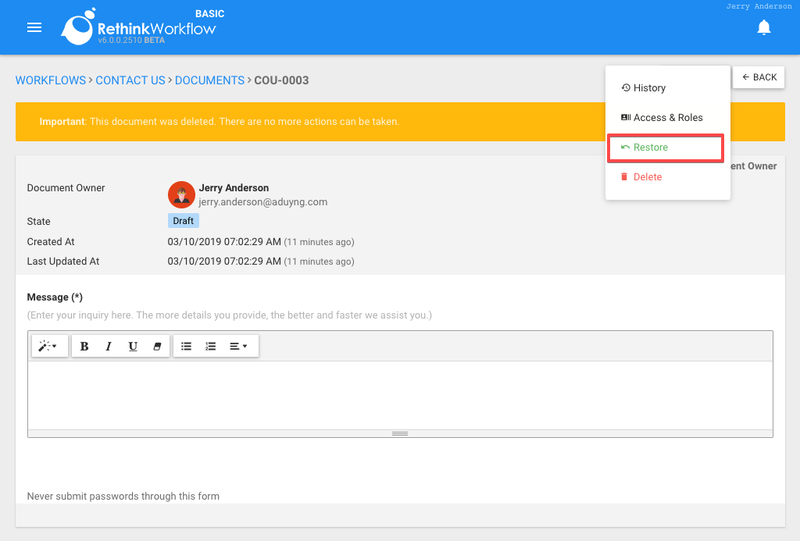 Rethink Workflow offers an easy and streamlined authentication process for the new user to create an account and sign in before creating a new document. As a company we think you should be able to style the application to match your organization's colors and logos. 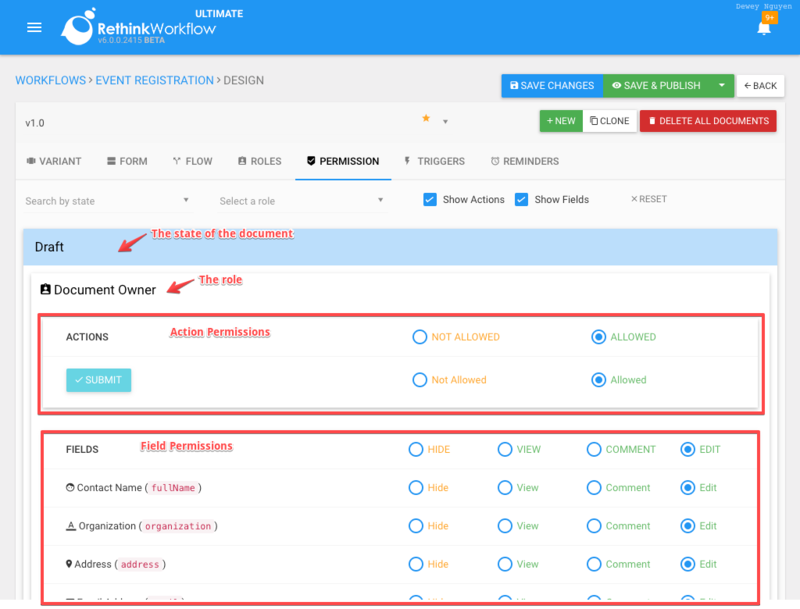 So we have provided you a great way to make your users feel right at home when they use Rethink Workflow. There are two places where you can upload your organization's logo. Once you have done this, the next time a user access a workflow published by your company, they shall see the branding as designed by you. 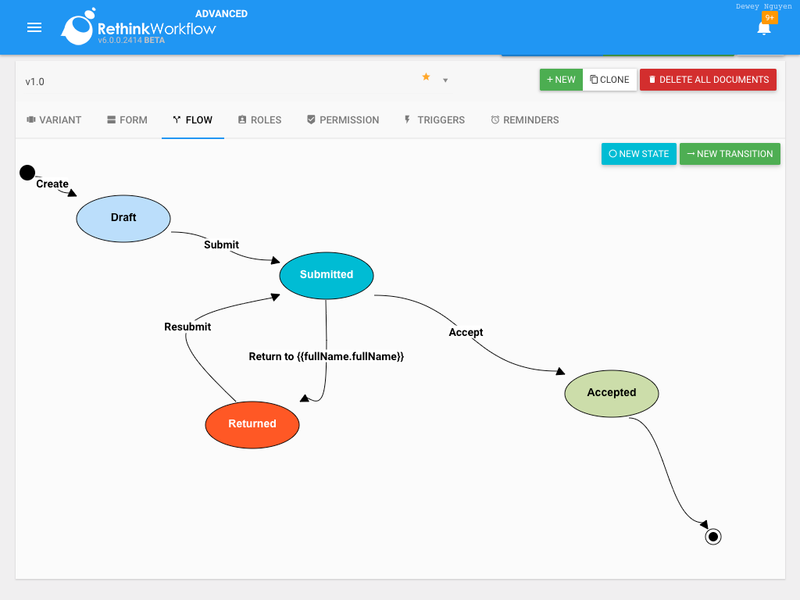 Below we have created a sample public workflow being accessed by a user. The workflow is to schedule a pet appointment. When a user tries to access the workflow by clicking on the link ( that you may have provided), this is what they would see. You can change the company logo inside Rethink workflow by uploading a picture and positioning it as you need it. The video below will demonstrate how you can upload a logo from your computer and replace the Rethink Workflow Logo. We recommend using an image with a transparent background. 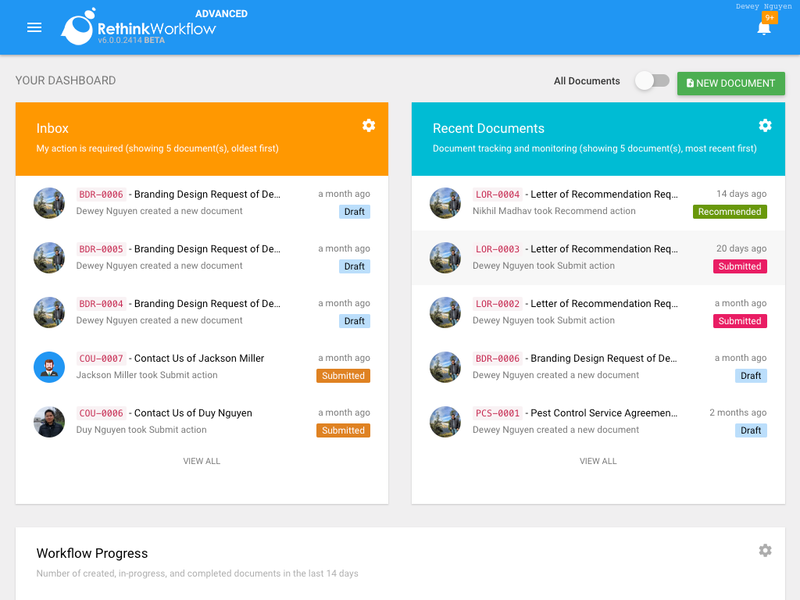 Rethink Workflow provides both Overall Dashboard and Workflow-specific Dashboard. The overall dashboard is usually the first screen you see after you sign in to our system. Most of the features of this dashboard are self-explanatory. 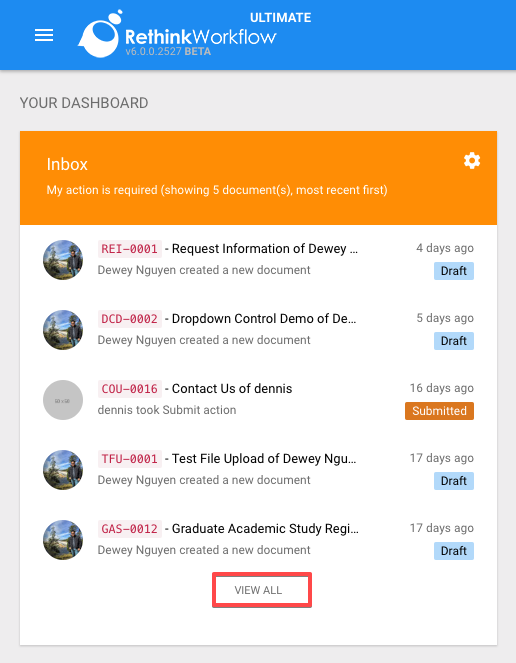 This dashboard gives a quick glance at all the documents that you are being a part of. 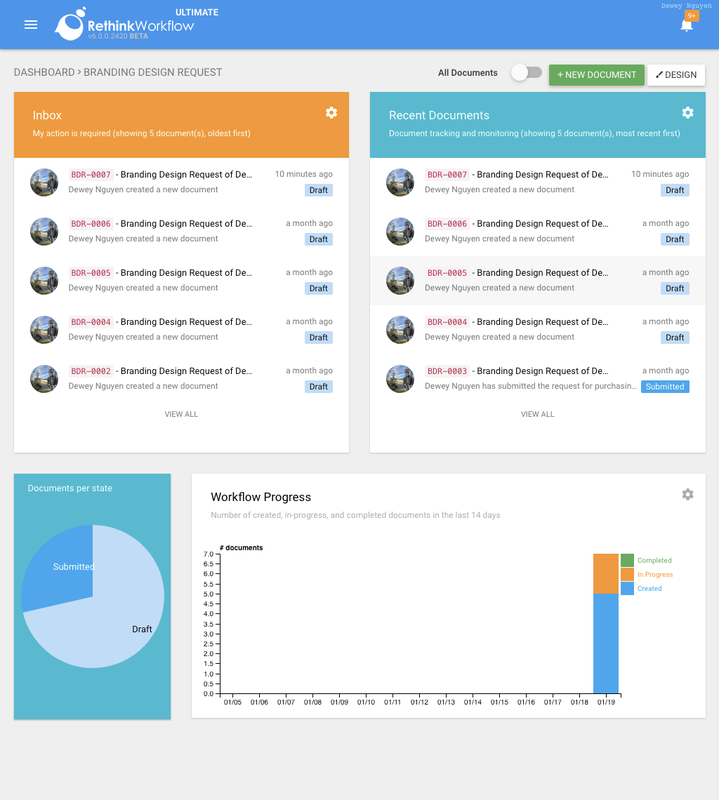 Each workflow has its own dashboard called workflow-specific dashboard. The information presented in this dashboard is only for the selected workflow. This feature allows organization administrator to configure a check to prevent duplicates. For example, in an event registration workflow, the administrator can configure the system to accept only one application per email address. 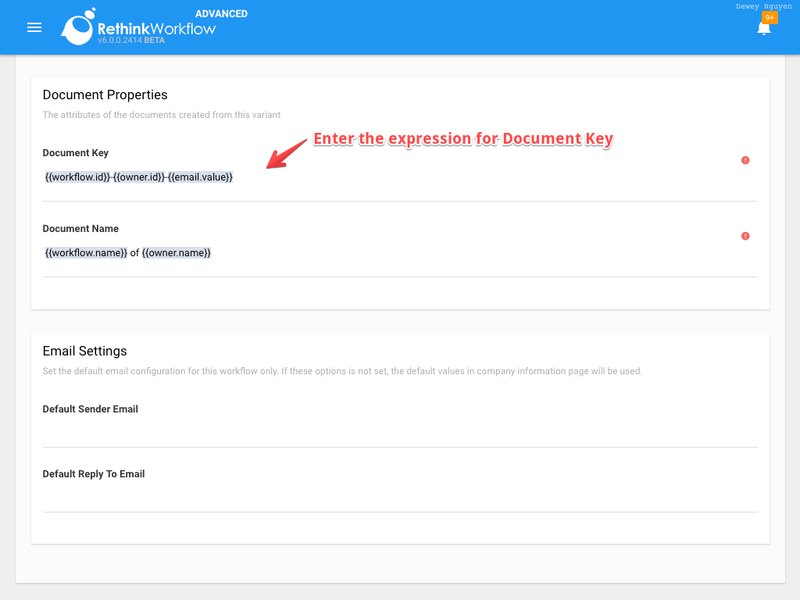 The first step to set up the unique document check is defining the unique document key. This key usually contains placeholders which can be replaced by the system values or field values entered on the form. 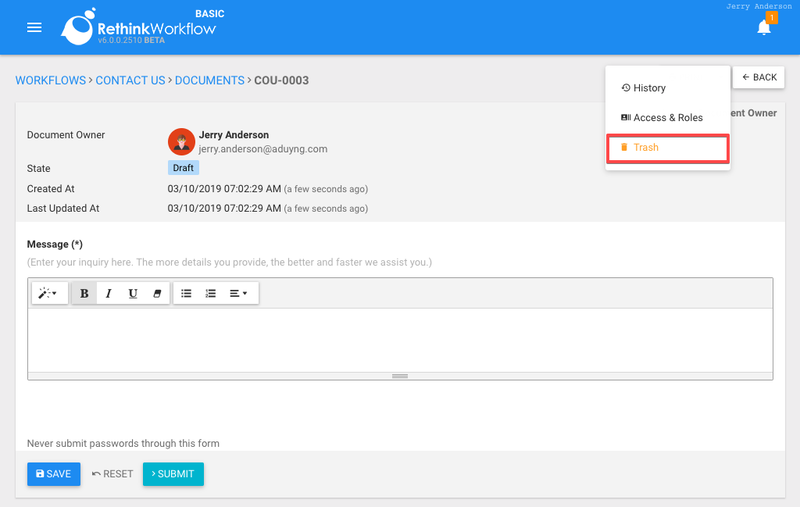 The expression above contains the workflow ID, the document owner id (the end-user who creates the document), and the email address entered on the form. This expression will ensure that only one email address can be used for submitting a registration application. The company administrator needs to indicate which action the unique document check rule should be enforced. In the event registration example above, we would like the system to prevent duplicates only when the user is submitting or resubmitting an application. 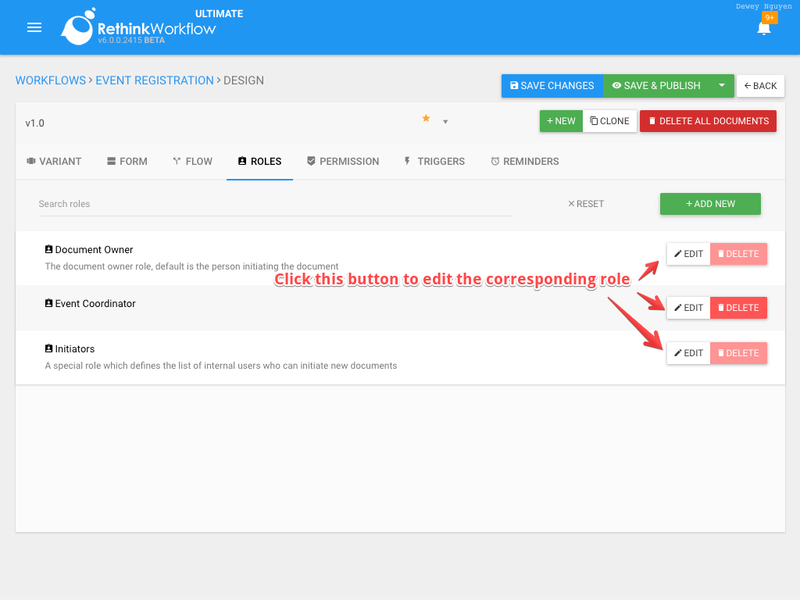 Event Registration workflow allows anyone to submit a registration application to attend an event. The end-user needs to provide their company information and submit the application. The application then can be reviewed by one of the event coordinators. The event coordinator can accept or return the application back to the end-user. The form is designed in a very generic way, but you can always customize the way you want. 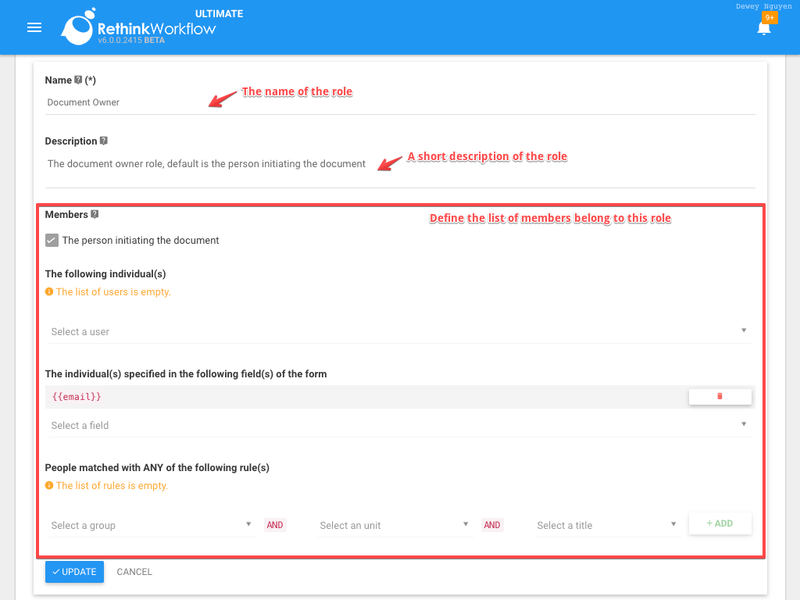 Rethink Workflow allows the administrator to configure the document name to improve the user friendliness and ease-of-use. 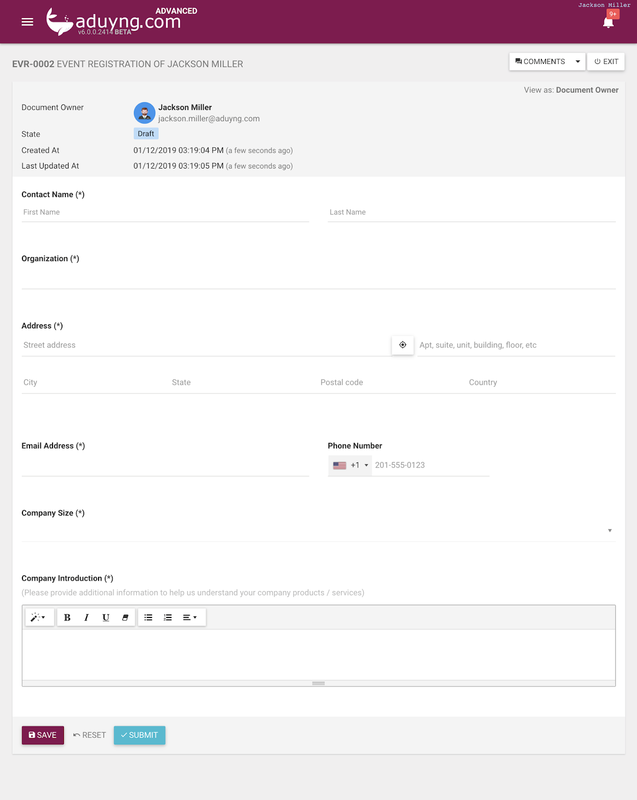 For example, instead of showing "RFL-0001 - Request for Leave", the administrator can configure the system to show "RFL-0001 Request for Leave of John Smith from 10/01/2019 - 10/03/2019" with the help of placeholders. On the workflow design screen, VARIANT tab is where the administrator can configure Document Name.